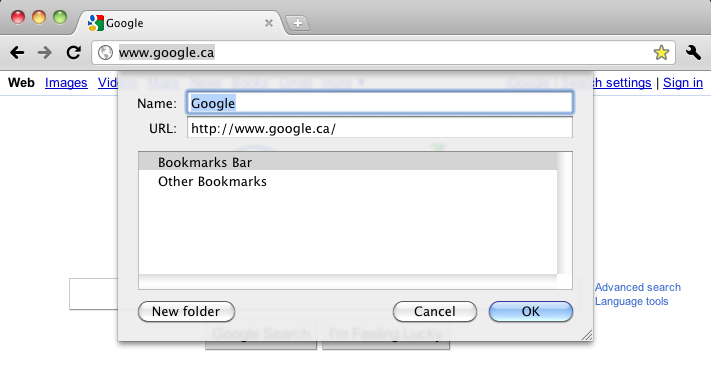 Bookmarks (also called Favorites in some browsers) are links to web pages. By saving bookmarks in Chromium, you can easily revisit pages without having to remember the address or search for them again, much like using bookmarks in a book. Bookmark the web page you are browsing by clicking the star-shaped Add Bookmark button located at the right end of the Omnibox. Alternatively, press the keyboard shortcut Control or Command + D to bookmark a web page. Confirm that you'd like to add the bookmark by clicking the Done button or by pressing Enter on your keyboard. If you'd like to rename the bookmark or save it in another folder, click on the Edit... button. Type the new name of the bookmark in the Name field to rename the bookmark. Click on New folder to create a new folder for the bookmark. Once you are finished, click OK.